Oenotri restaurant has incredible pasta, cured meats and pizzas, but it’s not in Naples—it’s in Napa. Two American chefs channel southern Italy in the heart of California wine country. 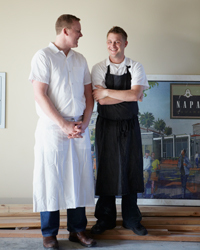 Every day, at exactly 4:15 p.m., chefs Curtis Di Fede and Tyler Rodde of Napa’s Oenotri restaurant begin a ritual they call, somewhat prosaically, “tasters.” Their line cooks prepare every dish on the southern-Italian-inspired menu, all at once, and Di Fede and Rodde grab their forks. They don’t take little bites, either. They devour everything: wild-nettle pizza with green-garlic cream; the Sicilian chickpea fritters known as panelle; pappardelle with pigeon liver, walnuts and vin santo. When the cook passes them a plate of crispy fried haddock with onion fonduta, it’s clear from the look on their faces that they got into the restaurant business because they really love to eat. Diners at Oenotri can check out everything in the kitchen, from the house-cured meats to wood-fired pizza. Photo © Fredrika Stjärne. These daily tasting sessions aren’t just about making sure the line cooks correctly prepare the chefs’ signature dishes. These guys don’t even have signature dishes. 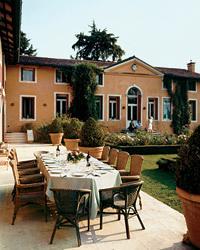 Instead, the “tasters” give Di Fede and Rodde a chance to ensure that every dish is as delicious as they want it to be. They have a clear sense of how they want their food to taste and a deep understanding of their ingredients—their olive oil and produce, the meat they cure themselves. They know the right moment to kill a pigeon to get the sweetest, most tender liver. Yet, despite their respect for tradition, the chefs still reinvent their menu almost every day, as dictated by whatever is freshest from their two farms and by what looks best in the meat locker. All of this explains why Oenotri is unquestionably the most exciting new restaurant in Napa Valley, and arguably the best new Italian restaurant in the United States. 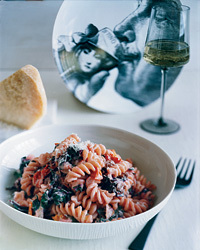 Di Fede and Rodde are far from the first California chefs to revere the Italian way of cooking. For a long time, the dominant strain in California cuisine was Provençal, thanks to Alice Waters of Berkeley’s Chez Panisse. Waters’s protégé, Paul Bertolli, pioneered California-Italian cuisine with Oakland’s Oliveto in 1993. In the way of Old World artisans, Bertolli built flavor “from the bottom up”—hand-grinding corn for polenta, killing wild boar for house-made salumi. He inspired Rodde and Di Fede, who met six years ago in the Oliveto kitchen after stints at other restaurants (Di Fede at The French Laundry and Bouchon; Rodde in a corporate job at The Cheesecake Factory). Bertolli’s 2003 book, Cooking by Hand, now holds pride of place on the Oenotri office bookshelf, informing every batch of sugo that the chefs make. Bertolli is not the only thing Di Fede and Rodde have in common: Both come from Napa families. Di Fede’s Italian great-grandfather ran the Beringer winery for 25 years, right through Prohibition, and his grandfather grew grapes for Pine Ridge Vineyards. Rodde grew up less than four miles from where Oenotri stands today. His father is president of Peter Michael Winery; today, his parents grow olives and grapes for Oenotri’s Rodde Family house label, available at the restaurant. After a horrific snowboarding accident that nearly killed him, Rodde decided not to go back to the kitchen at Oliveto. 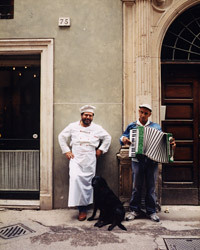 He and Di Fede agreed to open their own Italian restaurant. After that, says Rodde, “It was really simple. We sat down and said, ‘OK, Italian. North or south?’ South. There are multiple reasons: The pizza is better, and we love eating pizza. Plus, it’s way healthier. Northern Italian is all butter, eggs and beef. Southern Italian is fish and game. It’s cocina povera.” Oenotri’s cuisine relies on locally pressed olives. Photo © Fredrika Stjärne. 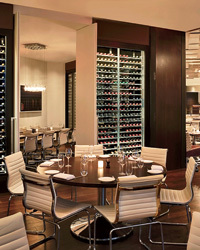 To direct the wine program at Oenotri, the chefs hired former French Laundry sommelier Sur Lucero. After tasting the food, Lucero went heavy on Italian imports, a provocative move in Napa Valley. He swears he did this because Italian wines match Oenotri’s food best, not because he hates wines from Napa. “Classic Italian wines have a strong streak of leaner acidity that races through them,” he says. “That makes them work better with tomatoes and the other vegetables on the Oenotri menu.” Lucero points out that a full third of his bottles do come from California, but he admits that nearly all are 12 to 15 years old, produced in an era when wines were generally lower in alcohol and, therefore, more food-friendly. To promote these wines, Lucero even runs a wine club so that customers can get some of his favorite bottles shipped to them at home. Oenotri’s approach is so basic that perhaps no explanation would ever sound right. The nettles on that pizza with green-garlic cream, after all, are just garden weeds; chickpea fritters are all about turning a cheap pantry staple into serious comfort food; and the pappardelle, expertly prepared with pigeon liver (or any of the offal common at Oenotri, like lamb testicles or blood sausage), reminds us that we can eat fabulously in the leanest of times. These dishes have an appeal that’s not so much about sophistication as it is about desire: the desire to do as Di Fede and Rodde do at their daily 4:15 tastings and devour the whole plate. Daniel Duane’s memoir, How to Cook Like a Man, comes out in May. Oenotri Olive Oil Photo courtesy of Oenotri. The olives come from chef Tyler Rodde’s parents’ farm. $25 for 12.7 oz; 707-252-1022. Peppery oil sold in cool metal bottles. $30 for 12.7 oz; theolivepress.com. Herbal oil from a famed Cabernet producer. $40 for 12.7 oz; 707-963-3994. Napa’s take on Italian grapes. Grignolino is an obscure grape even in Italy, but Heitz has been making this bright, berried red since 1961. Dan Petroski’s fragrant, minerally white blends Chardonnay with Italian varieties Tocai Friulano and Ribolla Gialla. This Ribolla is made using an old-school method of aging the wine on its skins, resulting in a surprisingly rich, orange, nutty wine. Best known for its Atlas Peak Cabernet Sauvignon, Grassi also makes a small amount of this pretty, citrusy white. Mario Batali's Favorite Italian Restaurants in the U.S.